On paper, this week’s Chicago Symphony Orchestra program looked like a conductor’s show all the way—Bartok and a Schumann symphony, with a Mozart piano concerto as the central palate cleanser. 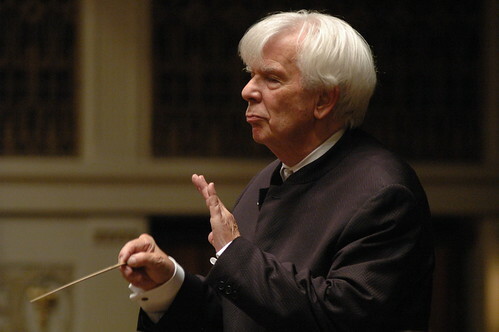 Yet while the performances under the venerable Christoph von Dohnanyi were thoughtful and technically scrupulous, the results proved surprisingly mixed. The high point of Thursday night’s program was provided by Paul Lewis, one of the most impressive young pianists of our day, making his CSO debut in Mozart. With his mythic status, modern audiences sometime forget that Mozart was one of the first, if not the first, professional freelance musician. After losing his court position, the Austrian composer set himself up as a self-presenter, writing three new piano concertos in the winter of 1782-1783 to perform in his own concert series. The Piano Concerto No 12 is the most engaging of the set, melodically bounteous even by Mozart’s standard, and Paul Lewis provided stellar advocacy. In recent years, the English pianist has concentrated on his award-winning set of Beethoven sonatas for harmonia mundi, yet his Mozart playing was as stylish and individual, as one might expect from a student of Alfred Brendel. His fluent light-fingered passagework was an ideal blend of vivacity and refinement. Lewis brought a poised eloquent simplicity to the Andante and consistently illuminated the solo part and Mozart’s cadenzas with subtle dynamic touches without ever sounding anachronistic. With Dohnanyi and the CSO providing witty, spirited backing on the same high level, the finale was delightful with Mozart’s themes batted back and forth between soloist and orchestra. This was first-class Mozart playing and a most impressive CSO debut by Lewis, who was warmly applauded by the orchestra members as well as the audience. Bartok’s Divertimento for string orchestra was the offbeat curtain-raiser. Though one of the Hungarian composer’s lighter works, in Dohnanyi’s hands it took on a stately, concentrated expression with a somber quality and an existential bleakness worlds away from the fiery Solti approach. The central section especially came across as one of Bartok’s darkest and most unsparing nachtmusiks. The terraced dynamic marking and extreme shadings of pianissimo were striking, yet the 80-year-old conductor’s measured tempos seemed awfully slow even for a Molto Adagio. This time the clouds weren’t entirely dissipated by the dance-like finale. Dohnanyi brought out the mercurial strangeness and angular folk flavor— with Robert Chen doing a creditable job of evoking the gypsy element in his violin solos—but this was a darker and decidedly more unsettling Divertimento than usual. The CSO strings were at their finest, however, with uncommonly refined, hushed playing. Schumann has long been a specialty for Dohnanyi and his reading of the Symphony No. 2 showed his experience in a performance that was a model of restraint and unfailing good taste. But do we really want unfailing good taste in Schumann? There was much to admire in a work that is often played for speed and volume: the transparent textures, tonal refinement, and careful balancing. A notably whirlwind Scherzo—the bane of auditioning violinists everywhere—came off best, with the CSO strings flying through the rapid articulation at a lightning clip. But otherwise, Dohnanyi appeared to be holding the music on too tautly controlled a rein. The first movement was supremely well paced but shouldn’t the brass cut through the textures with greater bite in the final pages? So too, while the Adagio was refined and expressive, Dohnanyi’s weighty treatment slowed the music to a ponderous crawl that flirted with stasis. And while the final movement opened with big-boned vigor, the closing section—one of Schumann’s most viscerally thrilling inspirations— felt far too sternly measured and controlled, as if allowing too much excitement or brassy punch would be playing to the galleries. The program will be repeated 8 p.m. Friday and Saturday and 3 p.m. Sunday. www.cso.org; 312-294-3000.